What’s the best VPN for Canada and which should you stay clear of? We’ve road tested over 120 VPNs and narrowed them down to a list of 5 we recommend. To make the cut, we looked for VPNs with fast speeds for streaming and torrenting, great apps for Android and iPhone, and top notch security and privacy features. We've also looked at how capable VPNs are at unblocking geo-restricted services such as Netflix, Amazon Prime Video and others. Whether you want a VPN for torrenting, accessing content such as Netflix, Amazon Prime Video and Hulu, or protecting your privacy from snooping internet provider, we’ve rounded up 5 of the best. ExpressVPN: Our top recommendation for Canada. Robust security, unblocks most major streaming sites like Netflix, and fast speeds. Includes 30-day money-back guarantee. NordVPN: Zero logs policy, strong security, and unblocks streaming sites like Netflix. All for a low price. CyberGhost: Budget friendly option that unblocks major streaming sites while offering great security and fast servers. PrivateVPN: Fast speeds and can unblock pretty much anything from abroad, including Netflix. SaferVPN: Easy-to-use apps, fast speeds, and unblocks Netflix. ExpressVPN servers are all optimized for maximum speed, and there are a lot of them–over 1,500 in 94 countries. It also comes packed with a kill switch–dubbed “network lock” in ExpressVPN parlance–and DNS leak protection. The provider can unblock streaming sites that most other VPNs can’t get at, including Netflix, Hulu, HBO, Amazon Prime Video, and BBC iPlayer. BEST VPN FOR CANADA:ExpressVPN is our Top Choice. It has a vast server network that is optimized for high-speed connections. Hard to beat on privacy and security. Unblocks streaming sites that other VPNs struggle with. There is a 30-day no-quibbles money-back guarantee so you can try it risk-free. NordVPN boasts a true zero-logs policy, meaning it doesn’t even record metadata about how you use the VPN service. It also features military-grade encryption, DNS leak protection, and a kill switch that halts all internet traffic in the event of a dropped connection. The company is incorporated in Panama, which has no mandatory data retention laws. Law enforcement has even confiscated NordVPN servers in the past to no avail–there was nothing there to find. NordVPN sports a large network of over 1,100 servers around the world. It isn’t always the fastest but it should offer more than enough bandwidth to stream video and download large files. You can also choose from servers specialized for certain scenarios, including double VPN, Tor over VPN, anti-DDoS, and ultra-fast streaming. NordVPN can unblock US Netflix, Hulu, Amazon Prime Video, and BBC iPlayer, among others. BEST BUDGET VPN:NordVPN is great on value. Solid security and privacy and works reliably in Canada. Use up to 6 devices at once with great connection speeds. 30-day money back guarantee. CyberGhost was originally developed in Germany and later relocated to Romania. Recently, however, CyberGhost was acquired by an Israeli firm registered in the UK, a member of the five eyes. This might be cause for concern for some users, but the company says it plans to remain a standalone company in Romania. On top of that, it maintains a strict no-logs policy. Even registration details aren’t registered, and new subscribers are instead given an anonymous user ID. Apps are available for Windows, MacOS, iOS, and Android. Subscribers can connect up to five devices at the same time. BEGINNERS' CHOICE:CyberGhost is easy to use. Great privacy with zero logs and DNS leak protection. Unblocks popular streaming platforms. 45-day money back guarantee. PrivateVPN is a small and young newcomer to the VPN scene, but it can square off with the big boys when it comes to both speed and security. The company is based in Sweden, which does have some mandatory data retention laws, but is not a part of the Five Eyes. In any case, the company adheres to a no-logs policy to ensure that it has nothing to hand over in the event of a court order to do so. The level of encryption depends on whether you use the TAP or TUN interface with OpenVPN. TAP uses 128-bit AES and TUN uses 256-bit; both are effectively uncrackable but the latter is technically more secure. You’ll also get perfect forward secrecy, a kill switch, and IPv6 and DNS leak protection baked right in. GREAT SPEED:PrivateVPN is a good family choice Allows up to 6 devices. Easy to use with excellent privacy and high speeds. It also unblocks most streaming sites and is suitable for torrenting. Lacks 24/7 support. 30-day money back guarantee. Download speeds were excellent in our tests. SaferVPN unblocks US Netflix in a browser, but does not unblock the Netflix app for iOS and Android. Apps are available for Windows, MacOS, Android, and iOS. The US is prominent in this debate because it got caught and because it’s a big country with a lot of economic and military power. But it’s far from the only country to employ the sorts of surveillance that toe–and sometimes cross–the line between national security and overreach into the lives of ordinary citizens a la 1984‘s Big Brother. One of those countries is Canada, thanks in large part to the 2015 Anti-Terrorism Act that allowed intelligence agencies to gather and share information in much the same way as the NSA. The underlying problem with these laws and surveillance programs is that they gather information on people regardless of whether that person is a criminal or not, and they disproportionately affect certain groups of people such as reporters, activists, Muslims, and immigrants. If you feel your privacy is being infringed upon, one of the best remedies is to start using a VPN. Short for Virtual Private Network, a VPN connection encrypts all of a device’s internet traffic and routes it through an intermediary server in a location of your choosing. This prevents hackers, your ISP, and, yes, the government from monitoring what you do online. 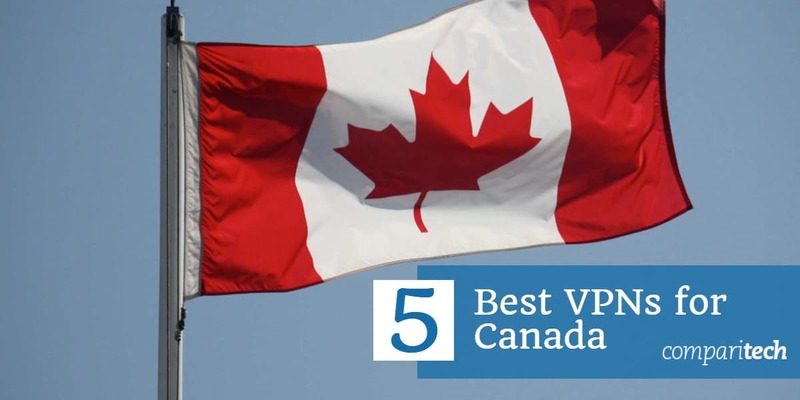 All of the options in our list of the best VPNs for Canada will also protect your data when connected to public wi-fi. Unsecured wifi hotspots can allow hackers to intercept your internet traffic and carry out attacks. A VPN’s encryption will prevent this from happening. Can I unblock Netflix, Hulu, and HBO with a VPN? Besides privacy and security, VPN services offer another useful benefit: unblocking geo-locked sites and services. Whenever you connect to a VPN, your real IP address is masked by that of the VPN server. An IP address is a unique string of numbers and decimals that can be used to identify specific devices and their approximate location. So by changing your IP address to the US, for example, you can access content that’s normally restricted to US residents. That includes the US catalog of shows on Netflix, Hulu, HBO Go, HBO Now, BBC iPlayer, and Amazon Prime Video. Unfortunately, many of these providers have caught onto this tactic and now block VPN connections. Only a handful of VPN providers are still able to unblock Netflix and Hulu in particular. From the list above, ExpressVPN, NordVPN, PrivateVPN, and CyberGhost will unblock US Netflix and Hulu as of time of writing. You may need to contact the VPN provider’s customer support to ask which specific servers to use, as not all of them will circumvent the VPN ban. Yes, VPNs are 100 percent legal in Canada. There are no laws barring VPN use in any Canadian province. It should go without saying that what you do while connected to the VPN is still your responsibility. We do not encourage or condone illegal or harmful behavior. Can I use a free VPN for Canada? We generally advise readers to avoid free VPN services. If security and privacy are a concern to you, consider that free VPNs still need to make money somehow. To do this, they often record usage activity, insert advertisements into web pages, and inject tracking cookies into web browsers. This defeats the purpose of a VPN when it comes to privacy. Free VPNs also tend to have a much more limited selection of servers, waiting queues, data caps, and bandwidth limits. In some cases, shady free VPN apps have been known to spread malware. Some are expected of being honeypots for intelligence agencies and law enforcement. There are a lot of Canada VPNs out there and we can’t cover all of them, but you may have come across a few in your search that should definitely be avoided. PureVPN recently came under heavy scrutiny after the Hong Kong-based VPN handed over logs to American authorities that led to the arrest of one of its users. While we don’t condone the man’s behavior–he was charged with stalking–we also don’t condone logging from a supposedly logless VPN. PureVPN says it only handed over IP addresses and timestamps to authorities, not actual records of activity, but it was enough to land a user in jail. None of the Canada VPNs we recommend above log users’ real IP addresses. Hola VPN isn’t a normal VPN. Instead, it uses a peer-to-peer browser extension with few centralized servers. That means your internet passes through other people’s households. A few years ago, Hola hijacked its users computers without their consent to create a massive botnet army. It went on to use that army to carry out distributed denial-of-service (DDoS) attacks and distribute pirated media. Hotspot Shield is a US-based VPN that recently fell into hot water when privacy advocates filed a complaint with the FTC alleging that the provider has been hijacking HTTP requests. When users attempted to go to certain ecommerce websites while connected to Hotspot Shield, the VPN would redirect them instead to affiliate sites where it stood to make a buck if a sale goes through. Hotspot Shield has also been known to inject tracking cookies into users’ browsers, then sell the information those cookies collect to advertisers. For the same reason we can’t recommend TunnelBear, we also suggest Canadians avoid SurfEasy and Opera VPN. SurfEasy is based in Canada and thus possibly subject to government demands for user information. The Opera browser now comes with a built-in VPN that was created by SurfEasy. Furthermore, SurfEasy has not entirely transparent with us about its encryption standards. Torrenting copyrighted material is illegal in Canada. Damages are capped at $5,000, however the policy is generally regarded as more educational than punitive. Comparitech does not encourage or endorse copyright violation, but using a VPN will prevent ISPs and copyright trolls from monitoring P2P filesharing activity and tracing it back to you. 12 Why use a VPN in Canada? 13 Can I unblock Netflix, Hulu, and HBO with a VPN? 14 Are VPNs legal in Canada? 15 Can I use a free VPN for Canada? 7 Why use a VPN in Canada? 8 Can I unblock Netflix, Hulu, and HBO with a VPN? 9 Are VPNs legal in Canada? 10 Can I use a free VPN for Canada?